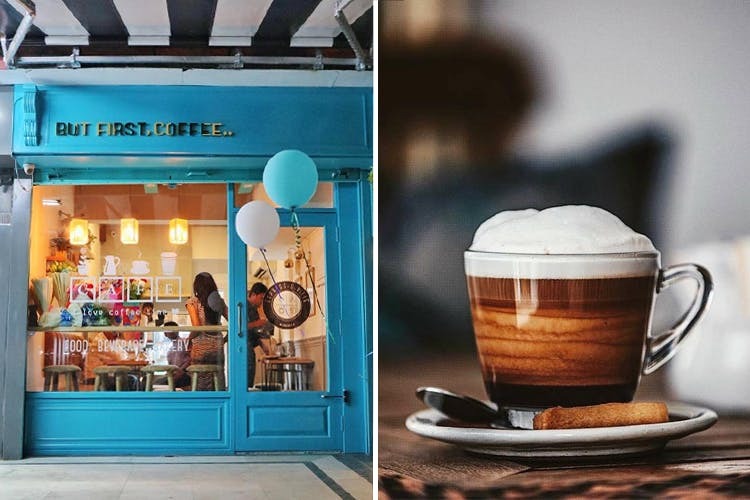 Are You Even A Coffee Lover If You Haven't Tried These 10 Types Of Coffee? There are two types of people in this world—Team Tea and Team Coffee, and then, there are those in-between too (but even they lean toward a side). If you identify yourself as Team Coffee, we're spilling the beans on the 10 different types of coffee you need to try to attain the 'coffee connoisseur' status. We may have missed a few types but hey, we're always open to recommendations (and more coffee). Perch was one of the first few places in the city to introduce a Coffee Sangria to its menu and it’s definitely one of the best. Their sangria’s made with red wine, in-house brewed coffee and a couple of juices that make the drink so very perfect. Be sure to order Perch’s popular Cassava Chips too. Also try the Caramel Bean and the Coffee Shrub with Tonic here. You're bound to come back for more. We’re tired of getting super-sweet mochas and lattes at most cafes, but the Sea Salt Mocha at Blue Tokai is unlike anything you’ll ever try. It’s a comforting cup of chocolate-y mocha with just the right amount of salt to undercut the sweetness. Who knew salt in coffee could taste so good?! More options: The Brew Room (Salted Caramel Mocha and White Chocolate Mocha). Jugmug Thela’s Vietnamese Iced Coffee is creamy, has a strong, coffee taste and while it’s a little too sweet for our taste, we still keep going back to Saket for it. Plus, Champa Gali’s just the place to enjoy a great cup of coffee, read a book and chill at on a good weather day. More options: Bamboo Boat (Vietnamese Iced Coffee), Rose Cafe and Music & Mountains Cafe (Iced Coffee). The Grammar Room is such a stunning, summer-y restaurant doing our favourite food and beverage groups — breakfasts and cocktails — so very right. Another thing they do well? Cold brews. Be sure to try Koinonia’s freshly-brewed Cinnamon Cold Brew, along with their Katsu Chicken Sandwich. We also hear great things about their Macchiato. More options: Blue Tokai (Cold Brew Coffee) and Sleepy Owl (Cinnamon Burst Cold Brew). One of Espress-o-Ville’s specialities, the Espress-o-Spritzer is a weird (but brilliant) combination of rose, watermelon, espresso and soda. The end result, however, is a refreshing coffee drink that we can drink pitchers of. Filter coffee is something that only a handful of places do well and, more often than not, they’re all South Indian. Carnatic and Sarvana both have a nice, smokey filter coffee that’s not too milky and not too sweet— just how we like it. Triveni’s is a great option too. Alternatively, you can even try the Cold Kaapi at Lota that comes with a shot of filter coffee and is iced. Thick, frothy and strong, Sibang’s warm cup of Macchiato is our winter favourite. If you’re someone who likes their coffee slightly sweet (not too overwhelming), their Caramel Macchiato won’t disappoint. More options: The Brew Room and The Coffee Shop. The Brew Room is any coffee lover’s paradise, because they’ve got so many speciality coffees like their Aeropress Coffee, the 18-hour Cold Drip coffee and their Turkish coffee. Brewed with Arabica powder and cardamom in a traditional ‘ibrik’ container, The Brew Room’s Turkish coffee is as authentic (and good) as it gets. It’s also a very sophisticated blend liked usually by experimental coffee lovers. SardarBuksh Coffee & Co is a relatively new entry into the city’s coffee scene, but a promising one nonethless. Their Java is great, and they have a lot of options on their menu like the Indo-Turkish Retro Coffee, Nitro Coffee and Espresso Tonic, but our favourite is the Bengaluru Iced Brew Frappe. Well, it’s a classic. There’s really not much to say about Depaul’s Hazelnut Coffee because it’s nostalgia in a slender plastic bottle. Strolling through CP with a Depaul’s coffee in hand is probably one of our favourite college memories. Also, try their momos. You’ll thank us.